Owners will be asked to sign a copy of the boarding contract prior to admission at Stonehill. Please print and bring contract at time of reservation. 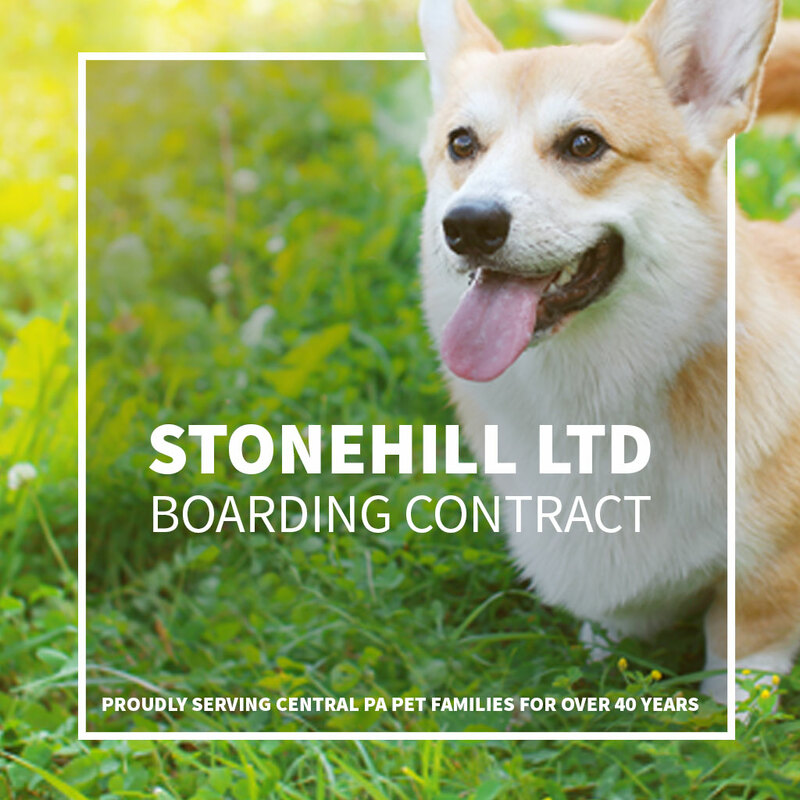 Boarding your pet at Stonehill will be a pleasurable experience. Your pet’s stay at Stonehill will be stress-free as our staff, facilities, and mission are tailored to each guest’s individual needs. If you anticipate your pet experiencing apprehension because of an upcoming boarding stay due to their boarding inexperience, Stonehill’s program features a pre-board acclimation option, which includes an overnight stay for your pet in advance of their extended stay to facilitate your pet’s acclimation to our staff, our other canine guests, and facilities. Make your reservations early and only for the time(s) needed. The pet-owner is responsible for paying the full fee, whether the reservation stay is shortened or the reservation stay is lengthened. When checking in with your pet, please be brave and supportive of your pet. Our experience with drop-offs suggests that owner approval and support is key; pets respond more positively to boarding experiences when accompanied with owner support and approval, which certainly allows you the ability to relax and enjoy your time away. We kindly ask that toys and other belongings are kept to a minimum upon admission. However, we do recommend a favorite toy or blanket from home to ameliorate any possible pet stress. Be sure to label all items clearly, with your last name and your pet’s full name. 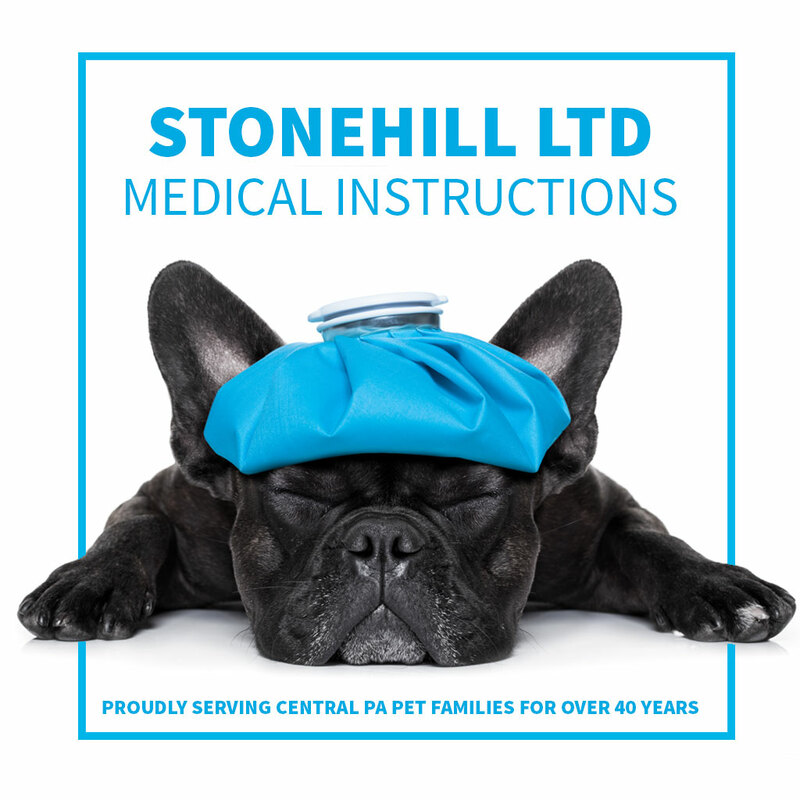 It is imperative that owner’s provide a copy of their pet’s most recent vaccination record at check in, as we require all pets to be vaccinated against communicable diseases (e.g., Rabies, DHLP and Bordetella (Kennel Cough) prior to admission. Your veterinarian may also fax vaccination records prior to check in. Pets without vaccine verification will not be accepted. Administrative charges will be applied to verify vaccinations or to copy records for our files. In addition, we also require pet license numbers issued by the county of your residence. Stonehill feeds Iams and Exclusive brand dog foods. You are welcome to bring your own pet food if you prefer. Please bring just enough food for your pets stay and label it clearly. Bowls are not necessary – please leave at home. We offer tasty treats during our afternoon quiet time. Our staff would be happy to fix your pet a Frosty Paw or a Busy Bone treat. Kongs are stuffed with a variety of treats and can be purchased for $3.00 per day. Please make sure any special medications are well labeled with pet’s name, owner’s name, and the dosage. Daily pill packs are appreciated. © Stonehill Ltd. All Rights Reserved.